Parents! Interested in learning how Todd VanDuzer and Zach Hamilton received a combined total of over $185,000 in college scholarships? Keep reading to discover the secret recipe so that you can too, even without a 4.0 or a high family income! Billions of dollars are given out every year, so make sure that you get a piece of the scholarship pie. Private scholarships are funds offered by private organizations or the government, so they do not come directly from the college you will be attending. Service clubs, companies, and charities give out about $2 billion in private scholarships each year. How Can I Find These Scholarships? Both Todd and Zach successfully applied to, and earned, dozens of scholarships. They have happily agreed to share their recipe for success. 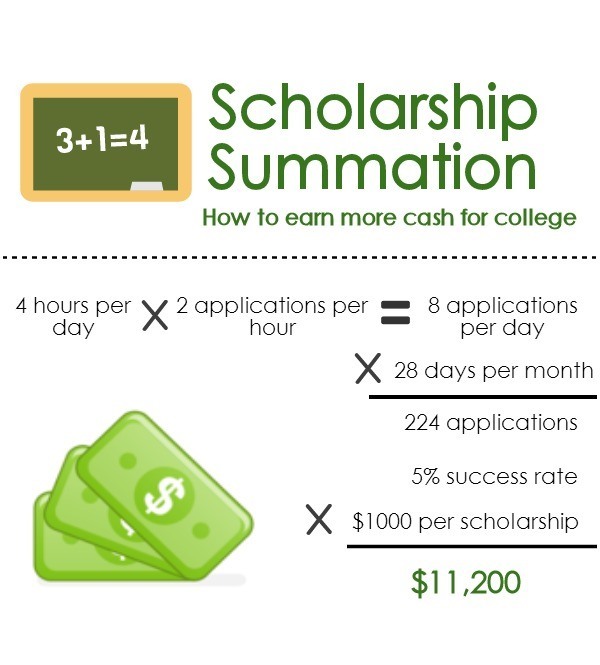 By following their steps, your child can score major cash for college as well. As you are beginning to apply for scholarships, it helps to understand what exactly the judges are looking for. Merit-based scholarship selection committees measure applicants based on a standard evaluation, rewarding the students who earned a certain amount of points on standardized tests. In contrast, private scholarships measure students head-to-head, leaving lots of room for bias and creativity. Since there is no standard measurement, it is important to figure out exactly what the selection committee wants to see you demonstrate in your application. Mark Davis, President of the Coca-Cola Scholars Foundation (which awards almost $2 million in college scholarships every year to hundreds of students), gives an inside look at how judges evaluate applications. The first glance at an application can range anywhere from 15 to 30 seconds. This is where judges will determine your eligibility, whether you included all required documents, and if you answered all of the questions. Messy or illegible applications are also weeded out during this process. The second time the judges look at applications is when they separate the adequate from the exceptional. This is where nitty-gritty spelling and grammar comes in, especially with word errors if you are using a computer, such as “principal” and “principle.” Judges will also be looking to see if you have completely and thoroughly answered each question. Once the judges have narrowed it down to a group of highly qualified students, they repeatedly examine each application and compare details between the applicants. Special attention is often paid to academics, leadership, service, creativity, and special circumstances. Scholarships can be awarded for any number of reasons, not just grades. Actually, the majority of the best scholarship programs are intended for students who dedicate time and energy to various fields such as music, foreign languages, community service, writing, leadership, and more. College scholarships may also only use GPA as a minimum bar to apply and not take it into account. 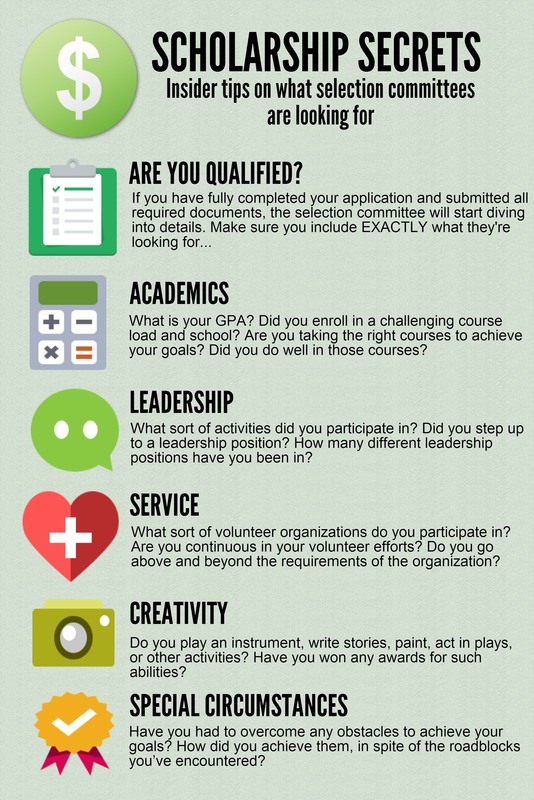 And in cases where GPA is evaluated, it is only one aspect of your application. The selection committee understands that you have so much more to offer than simply the grades on your transcript. When it comes to winning a scholarship, it’s about quality, not quantity. Devoting a lot of time to a few organizations that you are passionate about is going to be more impressive to a selection committee than joining a great number of organizations that you barely contribute to. Make sure that you are demonstrating your true self and what you care about through the activities you participate in. Now with some common myths debunked, resources to utilize, and awareness of the judging procedure, your child is ready to begin applying for scholarships! By spending a couple of hours every week dedicated to college scholarship applications, your child is one step closer to a debt free education. It’s just another reason to be grateful and proud of your child! Still interested in learning more? Check out this free e-book!